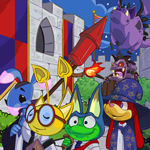 Most Neopians are not fully aware of what lies beneath Meridell Castle. Lost in the pages of dusty books in rotting libraries lies the truth most known only as an old faerie’s tale. The well versed among certain communities will surely be familiar with the Great Sinking of the Old Meridell Castle, followed by the Great Burning, the Great Splashing and eventually the Great Wailing, marking the end of the fourth Castle of Meridell and the construction of the fifth, which still stands today. Contrary to popular belief, there really are four castles, nearly four whole kingdoms, lying beneath the present-day castle. There may even be as many as three more, lost to the ages, but that is for the scholars to debate. Indeed few Neopians had an inkling what sat miles below the surface, but Talzadon knew, and he knew King Skarl knew, or at least he should. Talzadon flattened his robes and held is chin high as he awaited an audience with the king. He was a Kyrii, with a few gray hairs beginning to sprout through his shadow painted fur. In the past he would furiously deny any sign of aging, but now he was grateful for a spot of gray, as it would make him look more credible before the king. He had chosen his finest robes for the occasion, blue with a golden rope cinching them at the waist. It was essential that King Skarl take him seriously, yet he had a sinking feeling he wouldn’t. Talzadon was certain he had the solution to both of their problems. If he played his cards correctly, he could save the both the kingdom and his reputation. The double doors to the throne room suddenly lurched into motion with a painful creak. Light from stained-glass windows filled the hall before him, well illuminating Skarl on his throne. "Announcing Talzadon, the Mage of Meri Acres!" cried the armored Draik herald. Talzadon hesitantly slid into the room, suddenly quite unnerved before the king. "Speak now, mage, I haven’t got all day," barked King Skarl. "Sire," began Talzadon. "I come to you with a proposition, a solution to the famine that plagues our land. For many months, every crop has wilted and every seed planted is dug up and eaten by Crokabeks. Not even the earth faeries have been able to restore fertility to the land, and the rivers run dry. I believe I can conjure a spell to break the famine and restore fruit to all of Meridell." There was a dreadful silence in the room following Talzadon’s speech. He watched the faces of the guards, and noticed the corner of their mouths twitch and turn, and without warning the hall erupted in laughter. Every guard guffawed from deep within; one even fell to the floor in a giggle fit. In-between chuckles, one managed to speak to the silent king. "Sire, this mage is the laughing stock of Meridell! His greatest feat of magic was accidentally teleporting the princess into the rubbish dump! His father might have been Meldon the Mighty, but Talzadon has been banned from the Mage’s Guild for life!" Skarl had been silent up until now. He seemed unimpressed, even angry. "Mage," he sneered "what makes you think you could possibly reverse this curse upon our land?" "Well, with your permission Sire, I would obtain power from the depths of the deepest dungeons in Meridell, beneath the ruins of the Old Castle. I am convinced I could find the Whispering Wail Sword." The room, not fully settled from its previous bout, echoed with new laughter that bounced off the steep walls. Even Skarl chuckled for a second or two. "The Whispering Wail Sword is a myth!" cried Skarl. "No one has even made it all the way down to the castle that sunk. Many have attempted to descend into the old dungeons, seeking treasure and fame, and all have returned with nothing, or have not returned at all! Why should I give you permission to take on a fool’s quest?" Talzadon thought for a moment, but there could only be one answer. "Because you are out of options," he replied in a firm voice. "The silos of Meridell are down to their last grains, and soon there won’t be any reserves left at all to feed the kingdom with. If you are truly a good king, you will allow me to explore the ruins of Old Meridell, seeking the mighty sword that lies in its belly. If the legends are true, the magic contained within the Whispering Wail Sword will make Meridell a paradise once again." This time the room was silent, save for the low growl of a stomach, grumbling for food. King Skarl rose from his throne. "Fine," he began. "If you are so willing to go on a wild goose chase for a sword that doesn’t exist, go ahead. I suppose we have nothing to lose, and someone with your reputation doesn’t have much to lose either!" A murmur of chuckles floated around the hall. "One of my guards shall send you with provisions, and give you a key to the ruins, after that you are on your own. You leave at dawn." "Thank you, my king!" Talzadon replied gratefully. He couldn’t believe he would finally have the opportunity to hunt for the Whispering Wail Sword. He had been looking for the right time to ask for years now. Famine was only a convenient excuse. Talzadon spent the night in the barracks of the castle. Knights and squires stared curiously, some sniggering behind his back. "Laugh all you want," he thought. "I know things you couldn’t possibly imagine." As he fell asleep, he touched his pocket and felt the crinkle of paper beneath. "It’s still there, safe and sound," he whispered to himself. Talzadon fell asleep smiling. His dreams, however, were far from pleasant. All around him waves crashed, fires crackled, voices whispered and wailed. Wisps of ghost Neopets would approach and say things to him, but he couldn’t understand anything they were trying to tell him. Their voices became increasingly urgent until Talzaon awoke in the middle of the night, shivering and breathing unevenly. He refused to fall back asleep, and watched the sun rise over Meridell. The next morning a pink Draik guard handed him a parcel, presumably with food, and a key. She lead him to a rusting iron gate. From the dim light of his candle, Talzadon could see the tunnel stretch downward into the darkness. Water oozed from the stone walls, and he could hear Spyders rustling around on the ground. Undeterred, he unlocked the gate and took his first steps into the darkness. He has only made it a few feet when he heard the squeak of iron grinding behind him, and he turned around to see the Draik had closed the gate and left. He was truly alone down there, which meant it was time to bring out his secret weapon. Just to be safe, he waited until he had traveled for what felt like an extra hour down into the depths below Meridell. He moved at a brisk pace. After sufficient time had passed, Talzadon pulled from his robes a torn and weathered piece of parchment. It was folded many times and opened to nearly the size he was. He studied the ink on the wrinkles carefully, barely noticing the statues of ancient knights that lined the great hallway he had just entered. The hallway must once have been a beautiful foyer to the fourth castle of Meridell. There were windows, many cracked with dirt and rock pushing through. Nearly-shredded tapestries rotted off the walls. Talzadon paid little attention to these things, as he was nose deep in his parchment. The only sensory input he was cognizant of was his footsteps, which echoed many times in the vastness of the hall. "Wait a minute," thought Talzadon. As he walked he counted, and determined that his footsteps echoed just a little too much. Each step sounded three times. Once from his foot, once as the sound bounced off the walls, and one more time coming from somewhere else in the hall. He continued to walk normally, then stopped abruptly. This time there were distinctly a few extra footsteps in the silence. He whipped around, yet no one was there. A silence took over the room. He was certain he had heard the steps, but in the darkness, his mind might be playing games with him. Talzadon continues with this assumption until he reached a great doorway, which must have led to the rest of the castle. As he stopped before the door, he heard the steps again, and this time noticed movement out of the corner of his eye. "I know you’re there!" cried Talzadon into the direction of the motion. Whoever was there had to be hiding behind one of the statues. Talzadon approached cautiously, but just as he rounded a statue, something sharp lightly poked him in the side.